The "Scarrie Colts" Challenge! @OHLBarrieColts #OHL #ScarrieColts - Very Barrie Colts | A website covering the Barrie Colts of the OHL. I love team accounts on Twitter that have a sense of humour. Before we give you the wrong idea please know that we are not saying that the Colt one doesn't interact with fans or have a playful feel, because they have moments where they are a fun follow. There are times where we feel opportunities to be fun are missed and we feel it would be beneficial for them to maybe have a little more fun! We think an example of this would be to switch the Barrie Colts twitter name to "The Scarrie Colts". This would be a small change that might give the team a different look. Not just for local fans but for fans of other teams in different cities. Heck, why not even in America! And when we say "A new look" we just don'e mean because of a temporary name change or a Halloween themed logo, we mean a NEW IMAGE. It would make it look like an account that not only shares game scores after each period and team updates but as a team that enjoys playing around. There is so much more to Twitter than just giving fans updates. Twitter gives teams a chance to entertain. There are examples of teams that I am not a fan of but because of their EXCELLENT willingness to have fun and interact with fans I follow them just to see what they will do next. An excellent example of this is the LA Kings account. Not only do they joke around with fans (and haters) but they don't take themselves too seriously. That only raises awareness to fan bases from other teams and THAT is a good thing. Before we get too far off course, we enjoy the Colts twitter! I try to RT them on my personal account as often as I can with the hopes that their following can grow! This is our 20th anniversary as a team and though we have been successful and have a strong following, trying to find ways to increase your following can only benefit the team and build it up to be bigger and better! 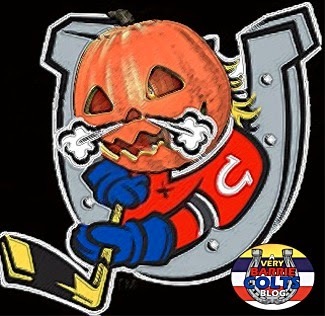 We challenge the Barrie Colts to change their Twitter name to "The Scarrie Colts" and maybe to use a Halloween themed display picture as well. We realize that by watermarking our image there is no chance of it being the one in this post, but if it is an image they would be willing to use I am happy to and more than able to remove it for that purpose. This is not us calling out the account. We love the account and the team. Hell, why else would I run a blog for the team? We just feel that with a little interaction with fans, other teams AND a willingness to be silly, it will only benefit the account and the team! Please share this and RT it on twitter. Don't be shy to tell them on Twitter that you like the idea and would want to see them change their name to "Scarrie Colts". After all, interacting is why we have Twitter. Oh, and feel free to use the hashtag #ScarrieColts as well! Follow the Barrie Colts on Twitter!